1) Main concern is- it's my first time using my green thumb for anything (I hope it's green haha) and I would like to know some personal tips and tricks or handy links on taking care of these specific ones and caring for them in a manner to increase potency over time and turn one cactus into more or have it sprout new columns. I live on the coast of Alabama near the Florida panhandle so weather does get a bit cold during winter and has a handful of overnight frosts occurring, but is hot and humid most of the year. 2) Has anyone had any success from local bought Pedro or his friends? 3) If so what method would be best for someone who doesn't have more than two days off of work in a row? I'm ok with bitter stuff and have honey and other sweet things to help with taste so am favoring a quicker or overnight crockpot method, but not trying to eat it raw. 4) How much do you think I should cut off to brew if I am 5ft 5in tall and weigh about 120-125lbs? I have had a few trips with LSD, one minor LSA experience, and Shrooms of various kinds in the past. Thank you to everyone in this place being so helpful! I've done plenty of web browsing, but not a lot on experiences with local store bought cacti and just want to get an up to date answer from a real person. Edited by Drooskie88, 29 October 2018 - 03:57 PM. The first thing is that the nursery mislabeled the cactus. From a quick glance I believe it’s closer to Trichocereus scopulicola from what I can see. San Pedro generally refers to trichocereus pachanoi but I digress :) congratulations hopefully someone with much much much more experience will post soon. *edit* multiple species are applied the name San Pedro I guess so they labeled it correctly? Can’t read the botanical name on the label. Grow sheet information. Simple start here. Tons of care information out there on Trichocereus. Dosing information provided on that thread. But we should find out what species of Trichocereus this is so we know how to dose you and give you more specifics on care information due to its natural climate. Edited by coleman318, 30 October 2018 - 05:21 PM. It states that it is a Trichocereus Pachanoi, which is why I got them. 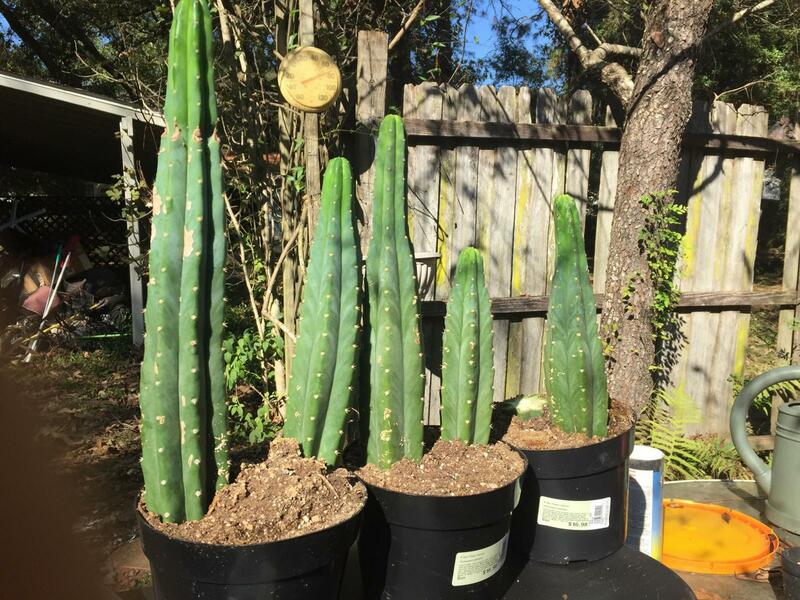 Going to do some research on- if it is a true Pachanoi, will the cactus gain potency if I continue to grow/clip and root new ones? And thank you for the links! They'll definitely be bookmarked. So I can tell you that I think it’s a scopulicola I’ll show side by sides soon. But from what I can read is that there is favorable mescaline content in scopulicola. But every cactus has different % of alkaloids so it’s really a crap shoot. I would assume dosages would be similar to pachanoi. Let us know what the diameter of the cactus at it’s thickest point, also what the length is. Unless the pics are misleading I don't much like the looks of the soil in those pots. It appears to be clay and clay holds too damned much water for too long. You want a lighter, looser soil that will drain completely within minutes of being drenched. I'll get some better close ups of them tomorrow in daylight. They are all about 2 inches thick and the thickest is 3 inches thick, height ranges between 10" and tallest was 2' but my dog knocked it over and the tip broke off, clean across though as if it was cut so I am going to try to root it once it calluses over. @Pharmer -That soil is definitely not good for it I will be changing it out in the next few days to set up I found in the forums. Gonna be a little disappointed if it isn't what the label says, very misleading and might anger someone more into this than I am thus far. Does anyone know if that company tends to mislabel entire shipments of their cacti? Thank you in advance to everyone who is helping me. I definitely would like to dig deeper into what kind of cactus they truly are cause I am really fascinated with cacti, etc. and want to start a true collection, but want to know what I really have. Edited by Drooskie88, 31 October 2018 - 09:04 PM. I’m waiting for one of the cactiphiles to step in. Okay so I think I saw your same post on Facebook I came here to respond what I found but now that I look at the picture I think you are the same person! It seems even though it the shape is off at the base it could be all the transportation different lighting conditions especially the top half of the cactus it was the bottom half I was surprised by. But it definitely has those steep Razorback notches and white areoles that represent PC pachanoi so I think it looks different but it really is a standard PC pachanoi just twisted up a little. Like stated in the other thread if it is intact pc pachanoi you would be better using these as grafting stock, I got 6 cuttings of what someone claimed authentic pachanoi from a plant brought back in the 60s it ended up being PC and wasted a bunch of cash, but I am now rooting it to use for grafting stock for the ones I want to grow out. Sorry guys, I am not ignoring your questions. I have had some sort of eye incident, and for the time being I can't see clearly at all. Vision is completely distorted in one eye, and fogged in the other. I blew the picture up about 500% trying to see it, and am going to say it is San Pedro, but is etiolated on the top, likely to have been in poor lighting for an extended time. There is only one way to verify potency, try it. I have some home depot pachanoi, and I have used it for years as grafting stock. It's taken about 40 min just to write this, so I am keeping this brief. Id say pc all the way.. but that means little. Environmental factors play the largest part. Like sky watcher said, only ever is one way to find out. Trials are in order. Maybe start small/mid 7-12" see where that goes. Leave the stump to grow more branches and your golden either way, great grafting stocks as mentioned above.